You may have seen “additional insured” on your insurance documents, or perhaps you heard your agent mention the term. 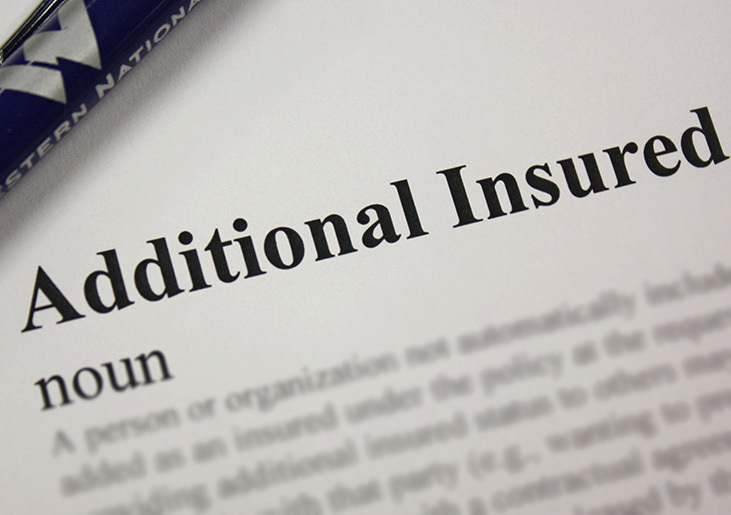 So, what exactly does “additional insured” mean? An additional insured is a person or organization added to an insurance policy at the request of the individual specifically named on the policy (also known as the “named insured”). In short, an additional insured is another entity covered by your insurance. An additional insured can be added to an insurance policy for several reasons—usually because of a personal relationship, financial responsibility, or because it is required by law. Contracts may legally require one party to be covered by the insurance policy of another party. For instance, a contractor may require a subcontractor to list them as an additional insured on the subcontractor’s insurance policy. This way, the contractor could make a claim on the subcontractor’s policy. It is also common for a manufacturer to be listed as an additional insured on a vendor’s insurance policy. An individual may also be listed as an additional insured if they have a financial interest in the property insured. For example, if a parent co-signs on a home their child is purchasing, the child would be listed as the named insured and the parent would be listed as an additional insured. The same could apply for a vehicle co-titled in both the parent’s and child’s names. One such situation would be where an adult child not living at home would insure the vehicle and the parent would be added as an additional insured. For more information or for questions about your coverage, contact your Independent Insurance Agent.